The pleomorphic adenoma- mixed salivary gland tumor- is a benign tumor, and the commonest salivary gland tumor. It is most commonly seen in the parotid gland and typically forms a mass in the lateral lobe, which slowly enlarges over many years, women in their forties are most often being affected. On palpation the tumor is firm, non tender and smooth or lobulated in texture. initially spherical and encapsulated, it may eventually spread more deeply, with the result that recurrence after resection is common. On oral examination the deep part of the gland may have pushed the tonsil and pillar of the fauces towards the midline. 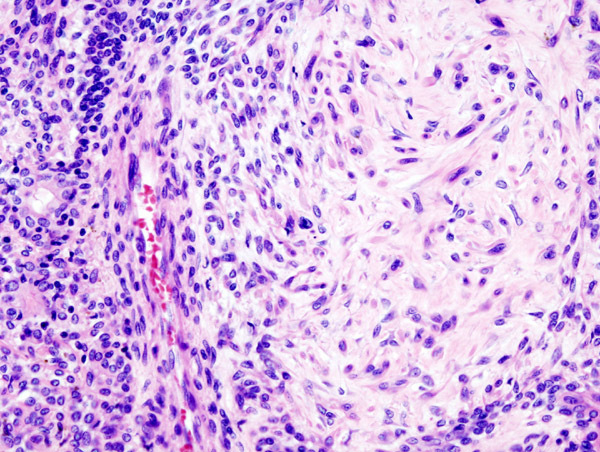 Histologically, it is highly variable in appearance, even within individual tumors. Classically it is biphasic and is characterized by an admixture of polygonal epithelial and spindle-shaped myoepithelial elements in a variable background stroma that may be mucoid, myxoid, cartilaginous or hyaline. Epithelial elements may be arranged in duct-like structures, sheets, clumps and/or interlacing strands and consist of polygonal, spindle or stellate-shaped cells (hence pleiomorphism). Areas of squamous metaplasia and epithelial pearls may be present. The tumor is not enveloped, but it is surrounded by a fibrous pseudocapsule of varying thickness. 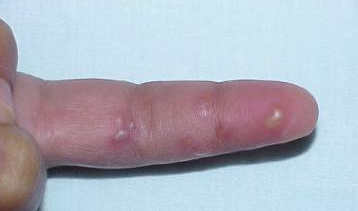 The tumor extends through normal glandular parenchyma in the form of finger-like pseudopodia, but this is not a sign of malignant transformation. 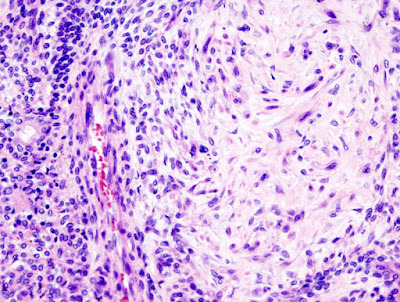 Pleomorphic adenoma consists of mixed epithelial (left) and mesenchymal cell components (right). The latter often exhibits myxofibrous appearance and in some instances shows chondromatous differentiation. It is a bening tumor and the second most common salivary tumor and is found exclusively in the parotid gland. It usually affects males in their fifties, forming a slow growing, painless swelling over the angle of the jaw, there is a high incidence of bilateral disease. Herpes Simplex virus infection may be caused by type I or type II virus and the infection may be primary or recurrent. 1. Systemic infection: e.g fever, sore throat and lymphadenopathy that may pass unnoticed. If the patient is immunocompromised, then the disease may become life threatening with fever, lymphadenopathy, pneumonitis and hepatitis. 2. Gingivostomatitis: Ulcers filled with yellow slough appear in the mouth. 3. Herpetic Whitlow: A breach in the skin that may be due to any minor trauma allows the virus to enter the finger, causing a vesicle to form. Often this condition is seen in children nurses. 4. Traumatic Herpes: Also known as Herpes gladiatorum. In this condition vesicles develop at any site where herpes simplex virus have been inoculated on the skin by brute force. 5. 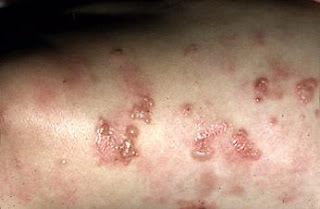 Eczema Herpeticum: HSV infection superimposed on eczematous skin. Usually seen in children. Introduction: Episcleritis is a common and benign inflammation of the episclera, typically affecting young and middle-aged adults. Seventy percent of cases occur in females. and can be seen beneath the overlying conjunctiva. Episcleral and conjunctival vessels blanch with the use of topical 5% phenylephrine drops, unlike deep episcleral vessels. Patients may complain of foreign body sensation, mild tenderness, irritation, mild photophobia, and excessive lacrimation. Pain is unusual but can occur, particularly in chroniccases. One-half of cases are bilateral. Eye findings are notable for a localized pink or bright red conjunctival injection, with involvement of the vessels in the superficial episcleral vascular plexus. Associated Conditions: Episcleritis is usually an isolated condition, though it may be associated with a number of systemic diseases, including rheumatoid arthritis, inflammatory bowel disease, lupus, and vasculitis. The skin functions as a barrier against potentially harmful physical and chemical agents as well as against different microorganisms. Sometimes different features may be seen that help to differentiate different systemic diseases. Facies in Primary Polycythemia vera. Sabaceous cyst which is also known as an epidermoid cyst is derived from hair follicles and it is a closed sac under the skin that is filled with a cheese like or oily material. It may be felt as small lumps or bumps under the skin. 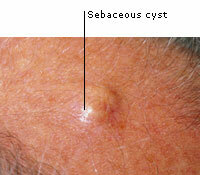 Sabaceous cyst represent one of the commonest skin lesions, occurring at any age after childhood. They are often multiple and occur in any hair bearing site on the body most commonly on the trunk, face and neck and particularly on the scalp and scrotum. They do not occur on the palms and soles. The main symptom is usually a small, non-painful lump beneath the skin. Grayish-white, cheesy, foul-smelling material may drain from the cyst. The lesions are well defined and hemi spherical, growing slowly from 1-2 cm across. they lie in the subcutaneous tissue but are tethered to the skin by blocked duct, there being a pit on the surface at the site of hair follicle. gentle squeezing of the skin over the cyst demonstrates this point of tethering though the punctum is sometimes difficult to demonstrate, particularly over the scalp; when present it is diagnostic. Definition: Scleritis is defined as inflammation of the sclera ( which is the white outer coating of the eye).Scleritis is painful, destructive, and potentially blinding condition of the eye. region. Associated features include tearing, photophobia, globe tenderness to palpation, and painful ocular movement. they blanch with topical phenylephrine. On slit-lamp microscopy, the episcleral vessels are displaced outward by scleral edema. Corneal involvement, iritis (with cells and flare in the anterior chamber), and decreased visual acuity may accompany scleritis. Bradycardia is defined as heart rate of less than 60 beats per minute. Often patients do not have any symptoms and it is detected as an incidental finding on routine physical examination. Some patients may present with faints or blackouts, drop attacks, dizziness, breathlessness or lack of energy. Findings on examination are slow pulse rate; normal or low BP with or without an evedence of secondary heart failure. Sometimes there may be symptoms and signs of any associated disease that may help in diagnosing the cause of bradycardia. ECG: Ambulatory ECG may help with diagnosis of intermittent bradycardia as in sick sinus syndrome. Blood tests: Thyroid function tests, Complete blood count, ESR, Urea, creatinine, LFTs, and digoxin levels (if pt taking digoxin). There is a constant bradycardia and ECG shows normal P waves and P-R interval is <0.2 sec. If patient is symptomatic management is hospital admission and cardiology referral. 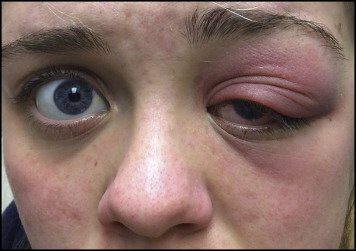 This young patient is referred to the ophthalmologist with the presenting complains of unilateral upper eyelid swelling and tenderness. The case of diagnosed as Dacryoadenitis. Acute dacryoadenitis typically involves children and young adults with associated systemic infections such as gonorrhea, mumps, Epstein-Barr virus, and Staphlyococcus species. Clinical Findings are localized to the outer one-third of the upper eyelid and include fullness or swelling, erythema, and tenderness. A characteristic “S”-shaped deformity with ptosis of the lid may be seen. In more advanced cases proptosis, inferonasal globe displacement, ophthalmoparesis, and diplopia may be present. Chronic dacryoadenitis is more common, is seen in older patients, and is usually due to tumor or associated inflammatory disorders such as sarcoidosis, Sjögren syndrome, or IgG4-related diseases. Dacryocystitis - Clinical Features And Management. Definition: Dacryocystitis is an inflammation of the lacrimal sac, positioned immediately distal to the canaliculi and proximal to the nasolacrimal duct. Etiology: Inflammation is usually secondary to obstruction of the nasolacrimal duct. During examination tears and mucopurulence may be expressed from the punctum when pressure is applied over the lacrimal sac. Dacryocystitis. Swelling and erythema over the medial lower lid and lacrimal sac developed in this 10-year-old patient with streptococcal pharyngitis. Up to 20% of normal newborns have a closed nasolacrimal passage, and 90% spontaneously open within the first 6 months. 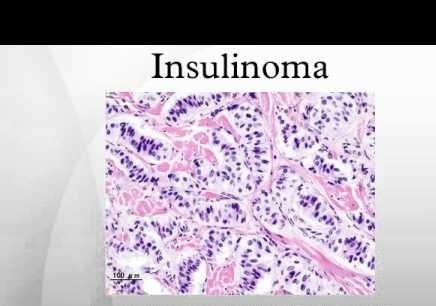 Insulinoma is a benign pancreatic islet cell tumor that produces excessive insulin and is derived from beta cells of the pancreas. The constant secretion of insulin from the tumor leads to hypoglycemia ( low blood sugar levels). 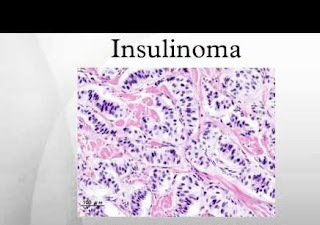 Insulinomas are rare tumors and mostly occur as a single small non cancerous growth is adults. People with genetic disorder known as multiple endocrine neoplasia type I are more prone to have this type of tumor. Its incidence is only 3-4 per million people making it one of the very rare tumors. Coma if severe hypoglycemia occurs. Allergic conjunctivitis is a condition whereby airborne allergens precipitate type 1 IgE-mediated hypersensitivity reactions in the conjunctiva. atopy, eczema, asthma, and allergic rhinitis. Small papillae may be seen on the tarsal conjunctiva. seen over the upper tarsal plate are pathognomonic. 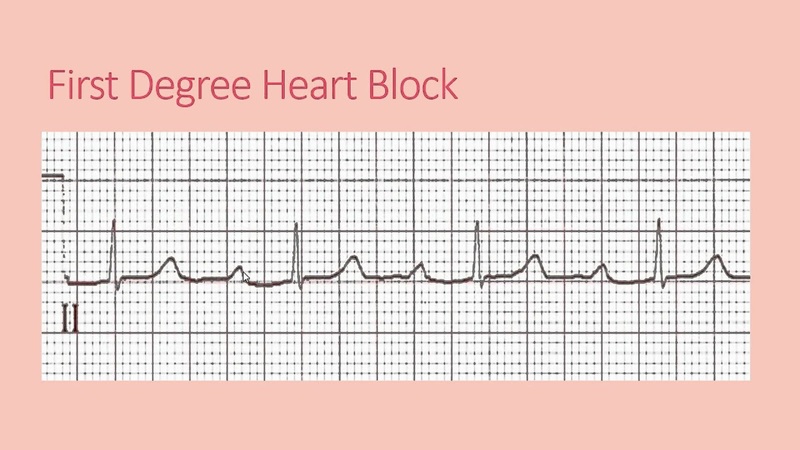 Heart Block is an abnormality in the electrical rhythm of the heart and it occurs when the electrical signals that moves through the heart are slowed or disrupted. 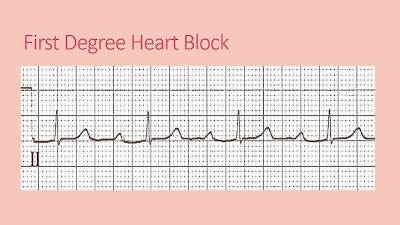 There are different types of heart blocks that are mostly diagnosed by the finding on the ECG. Normal Electrical Activity Of the Heart:A normal heartbeat is initiated when the heart’s natural pacemaker in the sino-atrial node located at the top of the right atrium creates the electrical signal which then travel through the atrium and reaches the atrio-ventricular node. After crossing the AV node these signals pass through the bundle of His. This bundle then divides into thin structures called as bundle branches which then extend into the right and the left ventricles. Through these bundle branches the signals finally reach within the muscle cells of the ventricles causing them to contract. In this way the ventricular muscles contracts as a whole and pumps the blood to the body. If this normal electrical passage is interrupted anywhere it leads to a condition known as heart block. In the first degree heart block the electrical impulses are slowed as they move from the atria to the ventricles, but they all reach successfully to the ventricles. This condition rarely causes any symptoms and usually do not require any treatment. On ECG patients with a first degree heart block will have a longer , flatter line between the P and the R wave. In other words the PR interval is prolonged. Central venous Line/ Catheter Related Infections In ICU Setting. 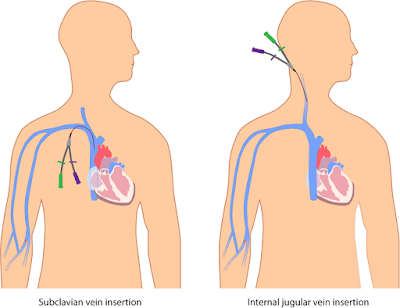 Majority of patients in ICU have central venous lines placed in order to provide fluids and medicines. They may be life saving but at the same time these can result in serious blood stream infections. These catheter related blood infections are reported to occur in about 3 to 8% of inserted catheters and are the number one cause of nosocomial infections in ICU settings. 1. 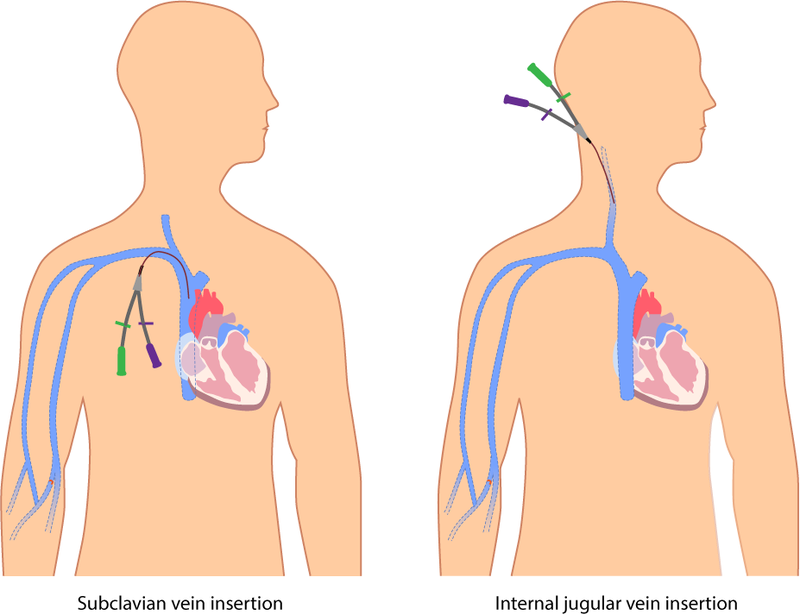 A central venous catheter or a central venous line is a catheter whose tip resides in a central vein. 2. Catheter related blood stream infections refer to an infection that is attributed to an intravenous catheter by quantitative culture of the catheter tip or by difference in growth between catheter and peripheral venipuncture blood culture specimens. 3. Central line associated blood infections is defined as an infection that appears in the presence of a central venous catheter or within 48 hours of removal of a central venous line and which cannot be attributed to an infection unrelated to the catheter. Site of the catheter with greatest chances of infection with groin insertions. 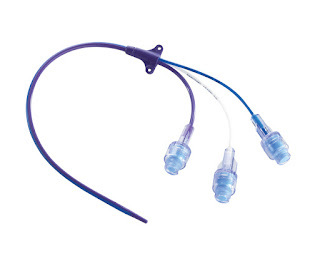 If aseptic techniques are not proper;y used while insertion of the catheter. Viral Conjunctivitis. Note the characteristic asymmetric conjunctival injection. Symptoms first developed in the left eye, with symptoms spreading to the other eye a few days later. A thin watery discharge is also seen. Viral conjunctivitis is a common presentation of the red eye. The tarsal conjunctiva may appear bumpy secondary to hyperplastic lymphoid tissue (follicles). Preauricular adenopathy may be present. The visual acuity is normal. The infection usually begins in one eye, but both eyes usually become involved due to autoinoculation. There are few to no systemic complaints. Adenovirus is the most common virus. A point of care test now available may aid clinicians to avoid empiric antibiotic therapy. • With infarction pattern—R-wave/S-wave ratio greater than 1 in lead V1 or V2 with infarction. 1. The posterior portion of the left ventricle has no EKG electrodes directly overlying it and is the last portion of ventricle to depolarize. It receives its blood supply from either the right coronary artery (in 85% of individuals) or the circumflex artery (in 15% of individuals). up to a backlight upside down and horizontally flipped, the more classic injury pattern can be observed by looking through the EKG paper (see picture below). Definition: Contact dermatitis can be defined as a red, itchy rash caused by any substance that comes in contact with the skin. It could be caused by an allergy, or because the protective layer of the skin gets damaged. 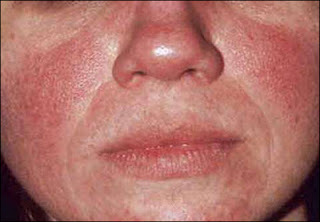 2.Allergic contact dermatitis: type IV hypersensitivity reaction. Uncommon often seen on the head following hair dyes. Presents as an acute weeping eczema which predominately affects the margins of the hairline rather than the hairy scalp itself. Topical treatment with a potent steroid is indicated. Contact dermatitis results in large, burning, and itchy rashes. These can take anywhere from several days to weeks to heal. This differentiates it from contact urticaria (hives), in which a rash appears within minutes of exposure and then fades away within minutes to hours. Even after days, contact dermatitis fades only if the skin no longer comes in contact with the allergen or irritant.